The fine art program is consisted of a series of graphic projects that are preconceived programs, mainly targeted on each individual small class helping the students to excel their artistic ability to their maximum extend. Each week will feature a different activity using a variety of media.Emphasis is given to each individual students’ skills and needs. No prior art experience is required! 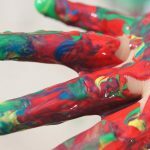 The Young Artist Program is a new monthly art program full of unique art activities designed specifically for young children. Starting with pencil drawing and progressing to pastel painting, you will learn to draw and paint portraits, figures, animals and still lift objects such as fruits and flowers, to create with proper proportions, lighting and shadows – through a step-by-step method to create the first master piece. Each week will feature a different activity using a variety of media. Emphasis is given to each individual student’s skills and needs while still working as a group. No prior art experience is required! Step by step method of drawing basic shapes to complicated one. Acquiring confidence in planning and starting a drawing or a painting. Working with oil pastels and acrylic colors (mixing and related work habits). Finish line: adding the details to create a fine art piece that your kid will be proud of. Each class starts with sketching and drawing to prepare for the actual pastel or acrylic painting later on. After establishing right proportions and understand of light and dark values, students will start to paint using oil pastels or acrylic paints. Students will learn clean and organized working habits. The Irvine Art & Music fine art program is consisted of a series of graphic projects that are preconceived programs, mainly targeted on each individual class (Small Class Structure) helping each of our potential fine art students to excel their artistic ability to his/her maximum extend. Our fine art projects will be commenced by instructing students important pencils based foundation projects: such as human and animal basic anatomy including shading techniques. Continuing, with whole picture compositions, such as: landscapes, human, animals, architectural backgrounds, perspectives, and also creation of different graphic textures that will be followed by introducing different fine art mediums. Writing Enrichment Lessons: Knowledgeable teachers are currently offering writing enrichment programs in Irvine Art & Music Center! Irvine Art & Music Center values the perseverance of Chinese culture. All of our Chinese teachers are certified, experienced, and passionate teachers. We offer group Chinese lessons as well as private lessons. Please consult with our front desk staff to arrange a private Chinese Lesson.